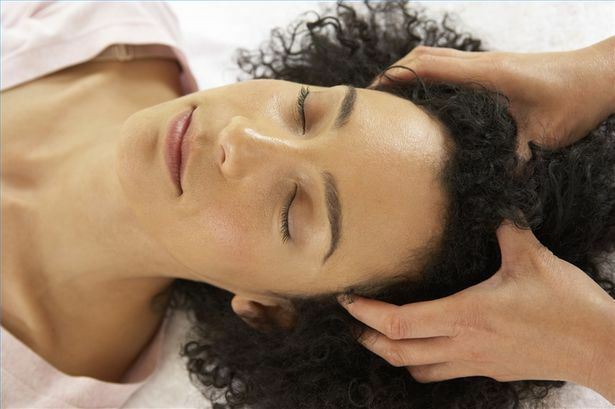 Do you ever take the time to give yourself a scalp massage? If the answer is “no”, then you’re missing out on a great opportunity for relaxation and hair growth. Scalp massages can stimulate blood circulation in the scalp, which will cause blood to flow to the roots of your hair, delivery oxygen and nutrients, allowing the hair follicles to produce hair more quickly. The kneading pressure applied by the massage warms the skin and opens up blood vessels to increase flow and boost circulation. Increased circulation means that the cells of the hair follicle will receive more of the nutrients necessary to optimal hair growth function. By increasing blood flow to the hair follicle, hair is less likely to go into the resting phase prematurely, preventing the appearance of thinning hair. It only takes about 5 minutes for an effective massage. That’s a little more than a commercial break on your favorite television program. The key to seeing results is consistency. Massaging your scalp a couple of times a week may not make a difference, so try to implement it in your daily routine. Boosts the strength of hair roots, which will lead to stronger hair. Stronger hair is less likely to break and will look thicker. Helps to prevent dandruff and dry scalp without the use of harsh chemical shampoos. Enhances blood circulation in the hair follicles and neck area. It helps soften and condition the hair and scalp, making it more manageable. It spreads the sebum (natural oils) of the hair, increasing hair luster and vibrancy. Use the balls of the fingers (not the tip, where your nails are) spread them out over the scalp and then press firmly on your scalp and move the fingers over the scalp. Knead your head in a firm movement, slow movement; your scalp should be doing most of the movement not your fingers. Do this movement on different sections of the head until all your head is massaged. The fingers of one hand can move in one direction, and the fingers of the other hand can move in the other direction. Keep the fingers of one hand still while the other rotates and visa versa. Start at the nape of the neck and then move up to the front of the head. This scalp massage is very effective to release stress in the neck and head area and it stimulates the glands and muscles in your head and neck area. Posted on April 14, 2015, in Natural Hair and tagged Hair Growth, hair strength, head massage, scalp massage. Bookmark the permalink. Leave a comment.